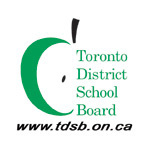 The Toronto District School Board (TDSB) is the largest school Board in Canada and one of the largest in North America. We have nearly 600 schools and serve more than 250,000 students each year. The Board is also supported by 22 publicly elected Trustees. Our Trustees work to ensure that all of our students realize their potential and succeed. They are advocates for education and are the voice of the public, ensuring all concerns are addressed. Chris Bolton, Trustee for Ward 10 (Trinity-Spadina) has been re-elected as the Chair of the Trustees of the TDSB.